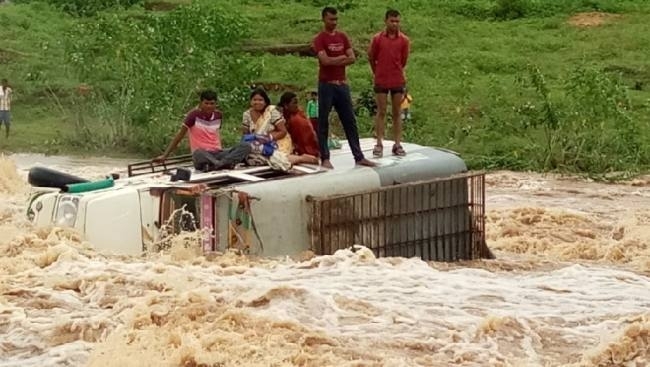 PATNA: Some 15 passengers aboard a pick-up van in Jharkhand had a providential escape when the vehicle they were traveling was washed away by sudden flow of waters in a local river. Reports quoting local media said the vehicle carrying villagers were crossing a local Matnag river in Manika police station of Palamu district when sudden discharge of water left it nearing floating. The local villagers raised an alarm for help when the vehicle hit a boulder and overturned. Luckily, nothing untoward happened as the depth of the river was not much at that point. Instantly, the passengers stepped on the roof of the overturned vehicle and cried for help after. Subsequently, they were saved by local villagers.